Rich in its aroma we get cooked blackberry and caramel with the slightest hint of smoke. The body is full and velvety with a hint of dryness. The acidity is varied with notes of cherry, mixed berries and juicy stonefruits complemented by notes of maple, molasses and dark malts. Baker's chocolate comes in the complexity, alongside fruit skin tannins, nuts and cacao. The finish has malts and cocoa with a little hint of green peppers. Rusty Obra had a big dream: Turn the Ka‘u District of the Big Island into a celebrated coffee region. After Rusty’s death, his wife, Lorie Obra, devoted their farm, mill and roastery to artisanal quality. Rusty’s Hawaiian has won honors for producing and roasting coffee — and now showcases exceptional beans from multiple Hawaiian regions. Lorie Obra is one of ten worldwide winners of the 2012 Roasters Guild Coffees of the Year Competition. She is also the Grand Champion of the Hawaii Coffee Association’s 2011 and 2010 statewide cupping competitions and received the Speciality Coffee Association of Europe’s 2010 Outstanding Producer award. Categories: Coffee Ratings. Origins: USA - Hawaii. Flavors: Baker's Chocolate, Berries, Blackberry, Caramel, Cherry, Chocolate, Cocoa, Dark Caramel, Dry, Fruit Skins, Heavy, Juicy, Low Acid, Maple, Medium Body, Mixed berry, Molasses, Nuts, Sticky, Sweet, and Velvety. Brew Descriptors: Fruity, Rich, and Smoky. 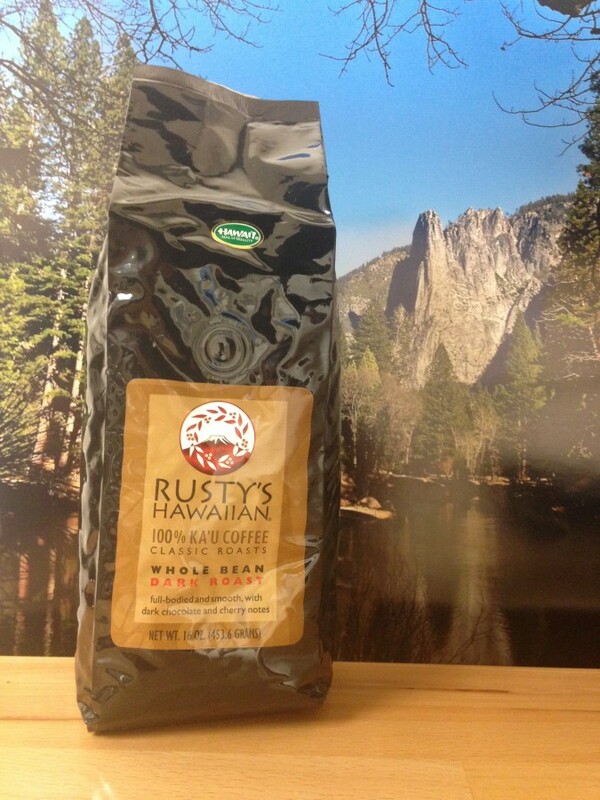 Roasters: Rusty's Hawaiian Coffee.